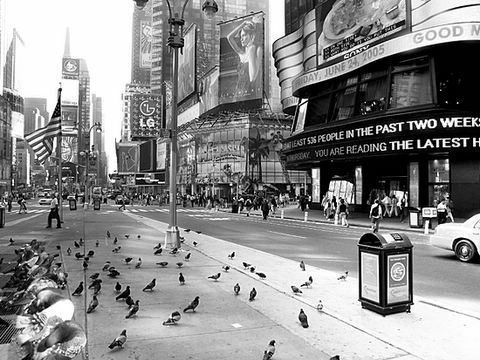 the composition really works- nostalgia in NY (a bit of the paris nostalgic style, where the pigion is always present). The flag, the light; beautiful! The b&w is WAY better. It's like an overload when looking at the color photo. I like the row of pigeons on the left. In the colour one they look like they are watching the crowds go by. B&W is preferable. Heh, the one thing I don't miss when remembering my time in NYC: pigeons. Lovely shot - I really rather like the pigeons! Your shots really make me want to visit NY again. 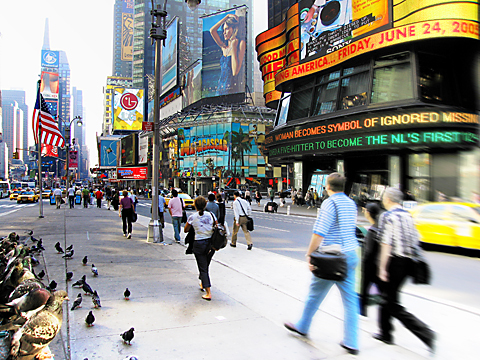 Time square is an amazing place full of life...and pigeons. Wow. I never saw times square as innocent as this one. I love your black and whites but this time I prefer the color version. Great shot! My 10 year old says.. this is a cool shot..he noticed the big pigeons standing back and watching the little ones!